ORDER BY CLAUSE: The ORDER BY clause is used to sort the query result by specific fields by ascending or descending order. By default it returns query result in ascending order. If we want Query result in Descending order then we need to write "Order by FieldName DESC ". 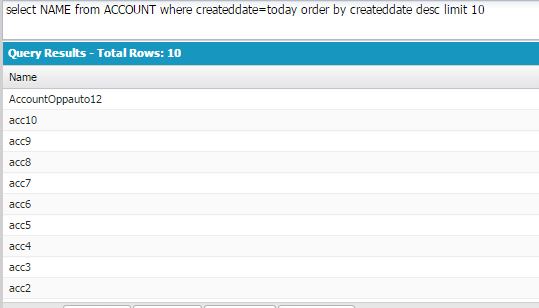 above soql returns First Ten account records which was created today. GROUP BY Clause: The SOQL GROUP BY clause can be used for collecting data across multiple records and group the results by one or more columns. for example i want to find out maximum "Annual Revenue" from Account records whose rating is "HOT".